Hog Roast Stourbridge Catering A Corporate Milestone Celebration – 30 Years Trading! Hog Roast Stourbridge can provide first-class catering for any kind of special occasion that you may have in mind, regardless of the formality or number of guests invited. We cater both posh and casual affairs, with both several hundred people queuing up for food or a handful of guests doing so, and for all kinds of parties and events, like wedding receptions, corporate hospitality and birthdays. Whether you’re organising your mum’s milestone birthday or your own wedding anniversary party, a meal to celebrate your little one’s christening or a big social event like a school fete, we have done it all and would love to make yours a success too. 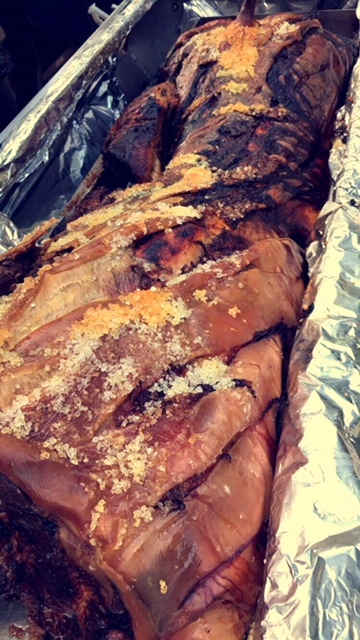 Several weeks ago, Hog Roast Stourbridge was asked to book in a corporate event at a local business, a car sales company whose boss wanted to celebrate trading for 30 years. To thank his employees, Peter wanted a feast served to them and their families and was also providing entertainment. We would be making our amazing, sumptuous pigs in buns for the 90 guests, as well as providing additional dishes and an alternative for a special diet, so when Peter called us, we went through our many options so he could choose the most suitable ones. In addition to the yummy hog roast rolls, Peter decided on four salad dishes, including our crunchy homemade coleslaw, as well as sweet potato wedges and new potatoes to be served, and asked about a vegetarian option. We have several dishes that we can make, and we can also cater for other diets too, as we want to ensure that everyone can eat our lovely food. For this occasion, Peter chose our veggie kebabs, which have fresh halloumi, mushrooms, peppers, courgette, red onion and tomatoes, and are adored by both veggies and carnivores alike, and can even be made vegan if needed, by us leaving out the cheese. On the day of the event, our Hog Roast Stourbridge team arrived several hours before service and set the beast cooking for hours. Later on in the day, once the staff and their guests had arrived and the band had started playing, we got busy serving lots of delicious food and satisfying everyone’s hunger.